As we come into the springtime, everyone is looking for something a little different. Bangs have always allowed us to change our style without making a huge commitment. Salon True loves changing people’s style to help them look their best! Today, any style of bang works! As long as it’s the right style for your face shape. 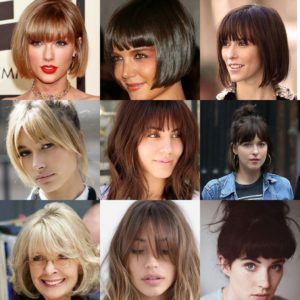 Whether it’s a long bang, full bang, wispy bang, baby short bang, or whatever your stylist at Salon True thinks will fit your personal style, it’s a great way to change it up! The trick though is learning how to style your bangs. Over the past twenty years, I have always had the same complaint of clients not knowing how to style their bangs. So here are some tricks to make sure they are done correctly to your liking. Step number one, make sure your bangs are wet! It’s important that you don’t let your bangs air-dry like the rest of your hair. Step number two, depending if your bangs are long or short, depends on whether or not your put product into your bang area before drying. Example: short bangs, no product, Longer bangs (from below eyebrows down) product. Step number three, make sure you have both a round brush, ask your Salon True stylist which is best for your style bang and also a flat paddle brush. Final step…DON’T CUT YOUR BANGS YOURSELF!!! Salon True offers complimentary bang trims to all of our clients 🙂 So, instead of running the risk of cutting your bangs too short or lopsided, come on in! There are many different hairlines around the face which can make cutting your own bangs very tricky. We offer the service of complimentary bang trims because we know how important it is for you to look your best!! Take a look below at some of these cool bang ideas. Happy Tuesday!